I can never decide whether I like spring or fall best but every time autumn rolls around I’m pretty sure it’s my favorite. And one of my favorite drives during the season is the route between Virgin and Cedar Canyon that takes in the Kolob Terrace section of Zion National Park, the Kolob Reservoir area and the aspen groves of Cedar Mountain and eventually Right Hand Canyon before intersecting state Route 14. I happened to have some time to explore Wednesday afternoon and I figured it was a great time to check in on the fall colors. For a good resource about the status of fall colors in the vicinity of Cedar Mountain, check out the Fall Color Report from my friends at the Cedar City-Brian Head Tourism Bureau. The drive begins on the east side of Virgin, where the Kolob Terrace Road (or Kolob Reservoir Road, as it’s also known) intersects state Route 9. The Kolob Terrace Road travels north/northeast past Under Canvas Zion (a new glamping camp that I only discovered on this drive) and Sunset Canyon Ranch before crossing into Zion National Park. However, this section of the park — which features the Smith Mesa Road, the Left Fork Trailhead, Tabernacle Dome and Cave Knoll — does not require an entrance fee. The road briefly travels outside of the park boundary through Cave Valley before entering Zion again near the Hop Valley Trailhead. As it passes Pine Valley Peak (pictured above), the road makes a steep climb onto the Upper Kolob Plateau, where you’ll start to see some surprising bunches of red foliage. On top of the plateau, the road passes the Wildcat Canyon Trailhead before entering a narrow canyon filled with aspens. These trees happen to be right at peak color as I pass through the canyon, looking anxiously for a pullout where I can stop to take some photos. I finally find one in a spot where there are quite a few small aspens with bright yellow leaves. It’s there I capture the photo above with the white trees and yellow leaves standing out in stark contrast with the deep blue skies. Shortly after the aspen-filled canyon, the road leaves Zion’s boundaries once again but just south of the small Blue Springs Reservoir is a dirt read leading east to Lava Point, which is within the park. It has been many years since I’ve actually checked out Lava Point so I decide to give it a try. The road is well-maintained and passable for most vehicles when dry, though it becomes quite narrow near the overlook so drive attentively and slowly so you don’t end up in a head-on collision with another car. Along this side road there are plenty of gorgeous yellow aspens but the final view, shown above, is the main attraction. Looking north you’ll see the cliffs of Zion Canyon with fall colors in the foreground. After Lava Point, I return to the main Kolob Road and continue generally northward past Blue Springs Reservoir, through the Kolob Mountain summer home community and eventually to Kolob Reservoir itself, shown above. The colors around the reservoir appear to be just past their peak, with a dustiness beginning to settle in among the yellows, oranges and reds. Now I’m beginning to worry that I’m too late for bright colors on top of the mountain. At the reservoir the road turns to dirt but it’s fairly well-maintained throughout and, again, is passable by most vehicles in dry conditions. Some spots are rockier than others so you’ll want to drive attentively and make sure you slow down in those sections, but overall it’s a good dirt/gravel road as it climbs and continues generally northward into the Kanarra Mountain area. Here the landscape often switches quickly between forests and wide-open areas that look more like a mountaintop prairie. 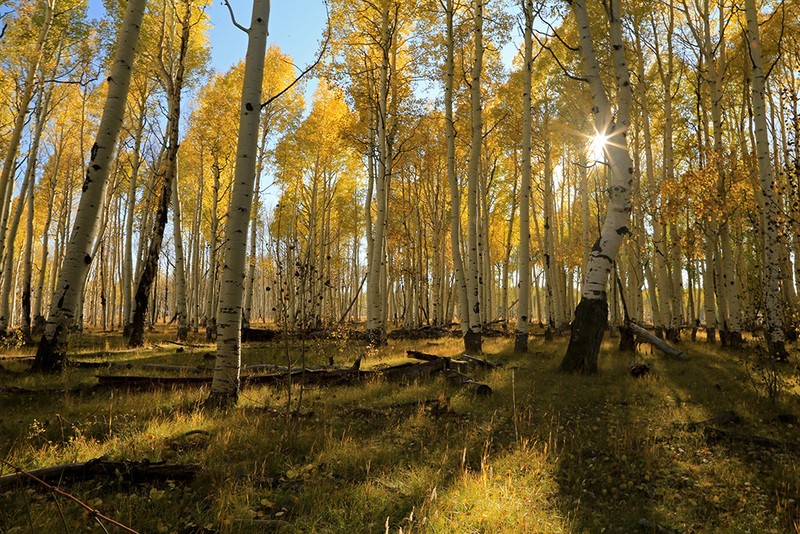 While the aspen groves are noticeably past peak with a brownish tint to the yellow leaves, when backlit they still appear as a lovely yellow. Going in and out of the aspen groves, I’m enchanted by the way the late afternoon sun is filtering through the trees. I set a small aperture on my camera (f22) to reduce the amount of light entering the lens, which not only increases my depth of field but also gives the sun a star shape as it shines through the foliage. Other spots grab my attention by how the light plays on the forest floor, illuminating both the soil and the fallen yellow leaves. I probably spent 10 or 15 minutes on this scene above, experimenting with different settings on my camera and various compositions. There are a few places where other roads intersect the Kolob Road/Right Hand Canyon Road but you’ll want to stay on the main route. It does occasionally travel east or west at times but it’s general path is northward. If you are unfamiliar with the road, I highly recommend bringing along a detailed state or regional map. Both Benchmark and DeLorme offer quality Utah atlases that show some topography and break up the state into smaller regions per page so you can see the detail of every turn along the way. I have copies of both and always have them with me when exploring Utah. Yes, a maps application on your smartphone can be helpful, but only when you have data network service and that is often not available in the mountains. Finally the road turns to pavement once again as it continues westward past yet another aspen grove. I must now be at a lower elevation because the trees are more colorful. In fact, the aspens here seem to be at their peak. While a gate prevents me from traveling onto private property, this dirt road heading south (shown above) provides a picturesque view. After passing this grove, the road turns northward again and begins a steep descent down Cedar Mountain with views of Cedar City below (including the trailhead for the “C” Trail). Along the way I notice a small group of deer grazing in a meadow so I stop to get a few pics before my final descent past a vibrant display of color in Right Hand Canyon to the intersection with SR 14. * All of the photographs in this blog are available for purchase. Send an email to brianisawriter@gmail.com to inquire about specific images. Prices for unframed, signed prints are: $25 for an 8×10 or 8×12; $35 for an 11×14 or 11×16; and $45 for a 12×16 or 12×18. I appreciated the pics and reminder of what a great drive this is. Thanks, Rita. I’m glad you enjoyed the post. It really is a great drive. Beautiful! However, next year try coming down Kanarra Canyon, which is spectacular towards the bottom, closer to the Red Ledges!!! Thanks for the suggestion. I’ve only gone that way once and it was a really nice drive. But that’s been at least seven or eight years ago. I’ll definitely have to try it next year.